HOUSTON -- Whether heavy earrings have damaged your ear lobes or they just don't look as good as they did when you were younger, one Texas doctor says there's a fix that takes less than 20 minutes. "I'm really tired of my earlobe being torn, and I really want to wear some beautiful earrings," said Jennifer Rondeno. Rondeno's right ear piercing is now a long, sagging hole, and her left ear lobe split completely. She went to Funk Facial Plastic Surgery for slit earlobe repair. "We have a tunnel of skin for where that earring was placed previously. We need to cut out that skin inside that tunnel, and then re-approximate those edges back together," said plastic surgeon Etai Funk said. The procedure is done in the doctor's office under local anesthesia. "It went great. I didn't feel a thing," Rondeno said. In six to eight weeks, the ears will be ready for earrings again and can be re-pierced. When the ears are re-pierced, women have to wear gold or gold plated studs for an additional three weeks. There's a two to three month process where you cannot wear dangle earrings. The cost of the procedure usually starts around $400. Beth Zerret, 74 is a patient with a slightly different problem. She says her earlobes haven't aged as gracefully as the rest of her body and have lost a lot of collagen. "These earlobes become elongated and thin, and frequently we have to reduce the size of those earlobes and make them a little smaller, and they look more youthful that way," Funk said. "By reducing the size of the earlobe and creating a nicely shaped earlobe that's a little smaller, it looks like a more youthful ear." If you're not ready to go under the knife, there's still a solution for you. "We can inject filler like restylane or juvaderm into the earlobe to plump it up and give it a more youthful appearance," Funk said. 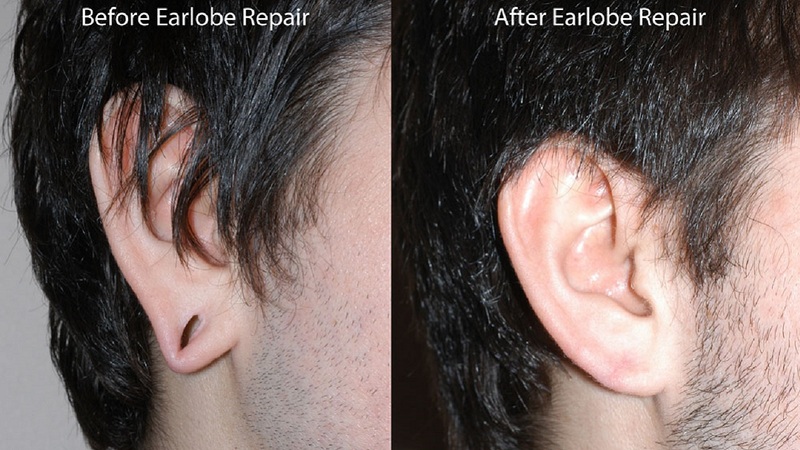 "Filler alone, will simply just cause a fuller earlobe but it will still look long." Fillers like that last six to nine months.